Quite a few of you wrote in (thank you! ), excited that *drum roll* the Bosch track saw is now available in the USA! The new Bosch saw, GKT13-225, looks a lot like the GKT 55 GCE plunge-cutting saw that Bosch released in Europe back in 2011. By itself, the Bosch GKT13-225 is a plunge-cutting circular saw, allowing for clean and precise cuts in wood and sheet materials such as plywood. Combine it with a Bosch track, and it’s a track saw capable of breaking down plywood sheets with long straight cuts. There are 4 track sizes you can use, from 31.5″ to 82″. Two of the sizes are also available with shelving pin holes. Being a plunge-cutting saw, the Bosch GKT13-225 also features a built-in dust collection port. It’s optional to use a vacuum or dust extractor with the saw, but that’s one of the perks of a saw like this. The Bosch track saw comes with: (1) GKT13-225 Plunge Track Saw, (1) PRO648TS 6-1/2 In. 48-Tooth Track Saw Blade, (1) Blade Wrench, (1) VAC024 Vacuum Hose Adapter, (1) L-BOXX-4 Carrying Case. Generally, you’ll want to buy a guide rail to go along with a track saw. So, factor in another $119 for a 63″ guide rail. You can save some money by going with a shorter guide rail if you don’t need one that long. But for making cuts up to 48″ long, you need that 63″ length (FSN1600). For your first track saw, more purchase planning is usually required. Some of you might be saying “$599 for just the saw! ?” Yep, that’s a reasonable point of entry for a pro-grade corded track saw. Once you understand the system, and have your settings dialed in, track saws are simple to use and produce fantastic results. Splinter guards help create clean cuts with reduced tear-out. The plunge-cutting mechanism helps you make stopped cuts, where you start in the middle of work rather than the end, that are more precise and accurate. It can help to think of a track saw as a table saw replacement, for easier and safer cutting of larger sheet goods. How much shop space is needed to break down a full sheet of plywood? How many hands, helpers, or accessories are needed to break down a large sheet on a jobsite table saw? For a plunge-cutting circular saw, you need supports for your sheet material (strategically placed 2x4s work great), a guide rail, and that’s about it. A lot of people have been hoping for Bosch’s plunge-cutting track saw to be available in the USA. Well, here it is! One question that’s often asked is whether this Bosch saw is made by Mafell, as the two brands’ saws bear striking similarities. I haven’t investigated this fully, but here’s a FOG forum thread that discusses the matter. since it says compatible with festool, mafell tracks I’ve always wonder if there was some relationship between festool and Bosch. Sort of stood to reason. I like it but for the same price comparison – what’s the festool model price today? I sort of expected the bosch to be a touch cheaper overall. FYI: Festool prices are the same no matter where you shop. It’s a dumb downed version of the Mafell. I have several tracksaws, once you go cordless there is no reason to plug-in. Dead on arrival. Honest question – I considered cordless before buying a corded Makita since I figured I’d need to manage a vacuum hose anyways, so why not wrap a power cable around it too in exchange for endless power? It’s worked just fine for me, but are you on to something I’m not aware of? If I could disconnect the power cord at the saw, a la Festool, I’d agree with you. Especially since track saw works best with overhead suspended vac hose. I got the Makita cordless for a very good price and am considering selling the Festool corded. Hard to explain, but it’s easier to handle a hose by itself than a hose and a cord unless you have a stationary place to use it and a dedicated dust hose. Then suspend them together. If you switch your 35mm hose to a sander, then a router, etc., the cordless makes sense, or if you use the saw in more than one place. I would choose the cordless today if starting new and may sell the Festool eventually. On the plus side, the corded will trigger an automatic dust system. No need to stop and recharge batteries with the corded. Since I had plenty of makita batteries, this wasn’t an issue. The batteries charge super fast, so I can put smaller capacity battery in while I wait for the 5.0 ones to charge. I know the thing about track compatibility always comes up so this is interesting. I think it is an acknowledgement that Festool is the unabashed leader of the track saw market. That being said I don’t know why i would plunk down money on a Bosch track thinking i wanted to go Festool at some time. I think most people would opt for the track that is designed and meant for their particular track saw. So the track compatibility issue always seems somewhat moot. From the other big competitors in the US market I understand DeWalt is unique and not compatible with either Festool or Makita. I understand also that Festool and Makita are marginally interchangeable although Makita is supposed to have another notch to prevent the saw from falling off the track if you are doing an angle cut on the track. That is something Festool does not have. The other new player in the track saw market is Kreg. I wonder if their design is their own or they are reselling someone else’s product. Like to see this product presented here on Tool Guyd. As for corded or cordless I was curious about the need for cordless. One of the biggest advantages of the track saw in general is how efficiently dust collection is integrated. But it seems if you are tethered to your saw with a dust collection hose, what is the big deal of adding an electrical cord? You would just have to experience it for yourself. I build regularly and use the Makita cordless track saw in my shop and on site. Sometimes it has a hose connected and sometimes a dust bag. To work efficiently, a hose is not always an issue but a cord, especially a cord which does not disconnect, can be a huge hassle for maneuvering, finding a place to put the saw between tasks etc. It’s a simple matter of being in the moment and knowing what works better. A hose pops off in a second when needed, but as far as cords, few manufacturers have disconnect cords. I owned a Festool TS75 for about 6 years and sold it simply because a compact cordless track saw is just more efficient. Constantly removing a bundled cord and hose for another tool gets old fast. Pricing is nuts. Why would anyone want to buy this if you can get a Festool TS 55 saw for LESS? Looks like Bosch doesn’t have a riving knife and only offers 1 year warranty (Festool gives you 3 years). Maybe the MSRP will get highly discounted once the newness has worn off. If it had been a larger saw – say competing with the TS75 – then maybe the $599 might make sense. Why are track saws so expensive? You can get a serviceable circular saw for $100. What about track saws means they’re worth 6 times as much? Paying extra for a track saw may not be worth it if you are just rough cutting sheet goods. For years I would break down plywood sheets using a straight edge and my Rockwell-Porter-Cable 4-1/2 inch worm gear saw – and then bring the rough piece to my Unisaw for final finishing. Provision to do bevel cuts – without trial and error fiddling to position the guide rail. I also wonder if it has to do with market size, i.e., amortization. If a company can sell a million circular saws each year, but only a thousand track saws, then their R&D and support budgets have to be spread out across far fewer copies in the track saw’s case. Pros that make hundreds of cuts a day don’t mind paying $600 for a track saw if it saves them 5 minutes of setup time on every cut. That time savings will pay for itself very quickly. What’s with that “12.5”” cord? On a separate but related note, one retailer mentions a 9′ cord, but Boschtools says it has a 12.5′ cord, so that’s what I went with. I’m sorry, I don’t understand the question. For the cord they use feet. But there’s a disagreement on the length between what I see on Bosch’s official listing, and a retailer’s listing, so I went with the Bosch value. My fault. The ?? wasn’t really a question – just wondering if the German’s cut their cords (USA-Standard or otherwise) for this saw to something like 3800 mm or and then round the spec to feet for the US market. Yep, that’s as far as big Karl (Bosch cord cutting division) can stretch out his arms. Gustoff the previous cord cutter could do 3.9M but he retired in 2012. That isn’t a reasonable price for this saw – why in the world would that price seem reasonable? If anything, it’s about the exact same price as the Festool and brings no advantages to the table. As mentioned above, warranty, riving knife, established quality and service to back it up? Not to mention the Makita plunge saw, which aside from no riving knife and a shorter cord is a good match for the performance of the Festool TS55 saw and can be had for $419 or less with a 55″ rail. 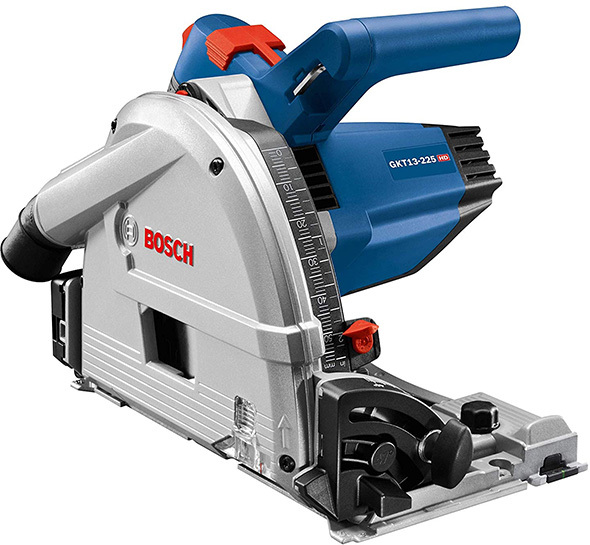 I’m sure the Bosch is a decent saw, but at that price, it’s only for sale to blue and grey fanboys. Perhaps I should have used more words and said that it’s reasonably and competitively proportionate to what I would expect the price to be. For a Bosch saw like this, $800 would have been raised an eyebrow for being too high, $400 would have led me to wonder what corners were cut. How would you have wanted me to phrase it? Plunge cutting track saws from top brands are expensive. Even the more affordable ones are 10X the price of an entry-priced circular saw, or at least 4X more than pro-grade circular saws. The seasonal Makita deal is currently still ongoing – https://toolguyd.com/makita-cordless-track-saw-bonus-bundle-deal-032019/ . That’s a great deal for a good cordless saw. A better choice? That depends on what the user is looking for. $400 bare saw wouldn’t have raised eyebrows when the corded Makita is even less and is known to be a great performer. It’s not as though it’s the old days where Bosch was still making quite a few tools in Germany and Switzerland. These days, most of their tools seem to be from either China or Malaysia aside from some German made grinders. I’m coming down off my I own a Festool high horse here for a minute since I own Bosch too. 1st question, who’s price doesn’t go up every year? So give it time and it will be a lot more reasonable. Honest Festool is not all it’s cracked up to be. I have seen a Kapex fail, a Carvex fail, and a TS55 fail all out of warranty and withing 6 years of use or less. So at a grand total of $2455 vs the Bosch equivalent of each at $1390 yeah it’s a heck of a sale. I bought into Festool and I like their tools but I have had the same performance out of the European line of Bosch and it gets lower in price as time goes not higher. So I hope they keep it up, keep bringing the European line over. Festool and Euro-Bosch are at the same level and if you can see that who’s the fan boy? Should have come to market with a cordless version. I’m not on Bosch 18V but at this stage in the game, cordless track saws are quite desirable over corded for convenience whether in shop or on job site and offer the same or more power. Same thing with Kreg, why a corded track saw and not cordless. There are so many corded track saws now on the market; it’s a ho-hum product offering. As far as I know, Mafell, Festool, Dewalt and Makita are it for cordless versions. I’m pretty sure Makita and Dewalt are selling huge numbers of their cordless track saws. are you going to use dust collection with it – then your cordless saw just gained a cord. well hose. I don’t so much see the benefit of a cordless tracksaw if you plan on running dust collection. But they are all making them now. paried with a cordless vac – maybe. but I would think if you use a tracksaw you want to use dust collection so you might as well have a corded saw and run the cord with the hose. The cord can get in the way and/or catch on the track – but not much more than the vacuum hose. Festool sells a $24 bit of plastic to cover the track end to let the cord slip along a bit better. I have seen folks using their track saws out on lawns – no vacuum attached – so cordless would have an advantage for them. I love my cordless makita track saw paired with the mafell dust bag. Captures 80% or more of the dust, totally cordless, all for less $$ and with more oomph than my old festool TS55… all without cords. Hard to beat this combo. My cordless festool saws (fsk, tsc55) with do a respectable job with the dust bags on em. Sight better than just letting it buck, that’s for sure. Just don’t let em fill up, they are a lot smaller than a ct36! Most MFR are releasing Bluetooth tools or batteries to activate the dust collector. Still have a hose to deal with but worth it in many cases. I do use the festool cordless Delta sander along with the Milwaukee Fuel backpack vacuum to sand out my corners, works a treat! Wood Magazine (Issue 260 – May 2019) just compared (Shop Test) 6 corded models (Dewalt DWS520K, Festool TS55 REQ-F-Plus, Festool TS 75 EQ-F-Plus, Grizzly T10687, Makita SP6000J and Triton TTS1400) and 3 cordless models ( Dewalt DCS520B, Festool TSC55 REB and Makita XPS01Z). They gave Top Tool Awards to the Festool TS75 (corded) amd Makita XPS01Z (cordless) , citing the Makita corded saw as Best Value. They provided a comparison chart with a matrix of scores. Notably they gave the cordless Festool the only “D” in the power category. They also noted issues with Dewalt tracks – saying that theirs were crowned, did not lie flat and had issue with connectors. They said that the Makita and Festool tracks were tied as their favorites. I’m very glad to hear that they have new, unique track lengths! I have a Makita track saw, but they only offer 39″, 55″, and 118″ lengths. The latter two are perfect for 4’x8′ sheet goods, but I cut a lot of 5’x5′ baltic birch, and the 118″ is cumbersome for that and has a lot of overhang that’s a pain to manage, especially in a small shop. I could buy another 118″ and cut it down to ~72-80″, but they’re very expensive due to high shipping costs because of the ~10′ length. The Bosch FSN2100 (82.5″) should be a perfect size for 5′ square sheets with just under a foot of overhang on each side. Just want to get a second opinion – since Bosch states their track saw is compatible with Festool rails, and my understanding is that Festool rails are compatible with Makita rails, does it stand to reason that my Makita track saw will be compatible with Bosch rails? Bosch use the same rails as Mafell. They are just branded as Bosch and are much cheaper! Festool rails will NOT work with with this saw, but once you use the Bosch/Mafell rails there’s no going back to the Festool rails; they are just that much better. You can join two together perfectly with your eyes closed in under half a minute. Enough reason, IMO to buy this saw over the Festool, that is, if you aren’t already heavily invested in Festool. I’m basing my advice on the UK version of this saw, the US model may indeed work on Festool rails. Toolnut will ship for it for free and they did have 10 off 100 off when you signed up for email offers if you decided on cutting down the 118″ track. Makita has a 75″ track, but not available in the US so far. The only real advantage over the Makita is that the track is designed to align when connecting. Does anyone know if the Bosch rails are compatible with Makita (and Festool) saws? It doesn’t appear to have the appropriate profile, but I can’t find a definitive answer. The fact that the Bosch saw supposedly works on the Festool rail doesn’t necessarily mean the opposite is true. I just noticed that Troy asked the same question a little before me. After taking another look at some photos of the Mafell/Bosch rail I can confidently say it’s not compatible with Festool/Makita saws. Dang – well, there goes my plan. I’ll have to shell out for another Makita 118″ rail or keep lobbying them to introduce a new length between their 55″ and 118″. That’s a *large* gap so I’m still pretty surprised that they don’t have anything in between yet. They released their 39″ just recently, so maybe there’s still hope. Thanks for investigating further and sharing your findings, though! I was also hoping to be able to use the Bosch rails for my Makita saw. I don’t want the single piece 118″ rail to lug around, but I know joining two rails isn’t ideal for keeping cuts straight. The Bosch rail connection method appears to be the best out there. Anyway, I suppose I’ll go back to my original plan of getting another 55″ makita rail and joining it when I need to make long rips. As for making that connection, I think I’ll be going with the TSO connectors (https://tsoproducts.com/tso-products-guide-rail-squares/grc-12-self-aligning-guide-rail-connectors/). I’m aware of the home-made option that many use, but I think the TSO option appears to be the best bet for keeping the rails straight. TSO makes great stuff, in case you’re not already aware. I hesitated on their GRS-16 for a while but am so glad I pulled the trigger. I just purchased the makita 118 track only from toolnut.com for 220 then -20 (with 20 off 100 sale) +25 for shipping.. Including tax was 240 ish. Acme had the same discount, but wanted $200 just for shipping. At that price, that actually might be my best bet – could cut off like a 78″ for the 5′ square sheets and have an extra 40″ left over for short cuts when even my 55″ track is a bit too long. Bosch and Mafell have a plastic piece in their base you remove so it will fit the Festool style tracks. But you cannot use the Festool or Makita saw on the Bosch/Mafell track. You failed to mention this is based off of the best track saw available, the Mafell MT 55 saw. Bosch worked out a deal with Mafell to offer us an ultra premium track saw minus a few features of the Mafell MT 55. The Bosch track saw has the power of a Festool TS 75 in a TS 55 sized package. The Bosch is a premium corded track saw, made in Germany, with nearly 90% of the features the Mafell MT 55 offers. The FSN guide rails used are also superior to the Festool/Makita style guide rails. The internet consensus points to it being made by Mafell. Is the motor the same? Speed controller? Other components? What’s different? There are things that disappointed me about my Bosch-made Craftsman Pro router, so much so that I recently (finally) bought the Bosch kit for added versatility. Because of that, I don’t want to be responsible for saying something like “it’s basically like the higher-priced Mafell,” because for some users the differences will be important. However, I won’t mind if anyone wants to do the legwork and find or highlight specific examples of what’s the same and what’s different. I didn’t fail to mention it, I chose to be responsible and provided enough for interested readers to springboard into their own investigations and research. FWIW…I have the Mafell and Makita track saws plus a ton of tracks, and also the Mafell KSS 300 which Stuart mentioned earlier. The little 300 cuts about 95% of my sheet goods as good as the others and much quicker and a whole lot else. LOVE that little saw! Its the one saw I would never part with. My apologies, I actually missed that part of the article myself. Too much multitasking and skipping to the comments to read those. Either way, this saw is not a Festool rip off and is every bit as premium as a Festool track saw. Sometimes it might seem like I missed something, when there’s a deliberate reason for omission or for only touching upon it. Other times, although rare, I do sometimes miss things. Dumbed down Mafell. The motor is NOT the same as the TS55. Nobody said the motor was the same as a TS 55, its much stronger. The ts55 is a weak saw. I’m sure Festool will have you believe it’s sized appropriately, but I’ve had 2-3 of them and would never accuse it of being overpowered. That might be a huge plus in the new Bosch camp. For the most part you’re right. As Ryan said, if you’re plugging it in and disconnecting it frequently, it can be a nuisance to go back to the saw and unplug the saw, but that’s rarely an issue if you’re batching out your operations. The other case for cordless is if you want to work untethered forbrief moments. I do this with a cordless tracksaw from time to time, but the bag fills up really quick, so if it’s more than 10 feet of material, I’ll just get the vacuum set up. It’s a high price to pay for a little convenience, but there you go. Also, in the case of Festool, the cordless has more power. In the Makita ecosystem, this isn’t a factor. Ugh, this was supposed to be in response to troys question about corded and cordless. Can you use a track saw in place of a circular saw? Like just use it for cutting 2x4s and sheet goods? It’d be nice if it takes the place of two tools. But… it’s a smaller saw with limited blade size. Cut quality is fantastic. But it’s much more of a specialty saw – in my opinion – for trim-cutting tasks. They market it as being for trim carpenters, floor-layers, and cabinet makers, but a lot of those users might be better served by a traditionally-sized saw. With the Mafell, you had better have an exact plan on how you want to use it. Deviate too far from its specialty, and you’ll likely need another saw. 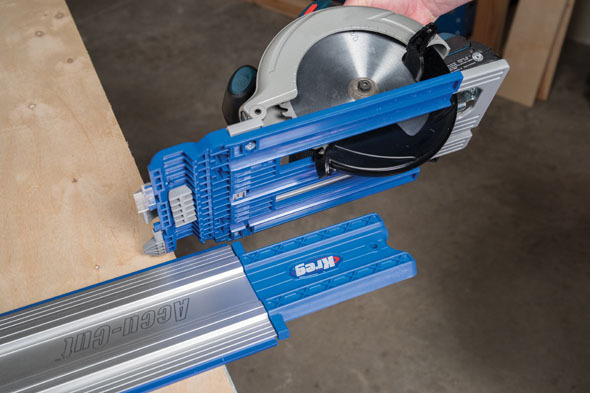 For the price of the Mafell, you could buy a top-brand plunge-cutting saw, guide rails in at least two sizes, AND either a great corded circular saw, or a cordless one. Even after all that, you might still have some money left over. Yes. But if you want to say use it for fast cutting of 2x lumber, you’ll probably want to change blades, and that’s a production since you’ll sometimes need a new anti-tear-out cut strip for your guide rail. For mostly guide rail use and occasional un-tracked use, it’s fine. Not really. The problem with a plunge saw is that the saw is on top of the piece you want to cut. Therefore you can’t align it on a mark if the piece of wood is not large enough because you just can’t see it. Plus, the saw is not really stable on a thin piece. A cross cutting saw like the KSS 300 is what you want for these type of tasks. Just think about it. Would you use a plunge router for everything or is a fixed base still useful? It’s the same with a circular saw. You need both a plunge and a fixed base. Another difference between a circular saw and a track saw is that setting the depth of cut is precise and easy. I have a higher-end Makita circular saw, but once I got the Festool I could see the difference in this setting. I can quickly easily cut grooves for cabinet backs, for instance, because of this depth of cut ability. Why pull out a router and do all the setup if the saw I’m using right now can do the same job. Not saying it will replace the router, but for this task it did. And will again. I’ve been using the the TSO square guide that clips onto Festool rails and can cut very precise panels that are absolutely square every time. The setup of the square is less than a minute. So, using a track saw enables this to happen quickly and effortlessly. I’m about to cut some rails and stiles using a cobbled together parallel guide and I’m pretty sure it will work well. One secret is to support the track. Folks over at FOG have some pretty nifty setups for this. None of these things are that easy with a traditional circular saw. Soon we’ll see if TSO products says their square will fit the Bosch tracks. If I were buying another track saw, I’d make sure that the track fit this jig. The thing is that the Festool tracks have some important jigs associated with them. No problem using my cordless Makita with these tracks, though I don’t cut angles with them. There was a big fuss about the Dewalt track saw being too short. Is it a typo? 82.5″? Or connect two together? What’s that all about? 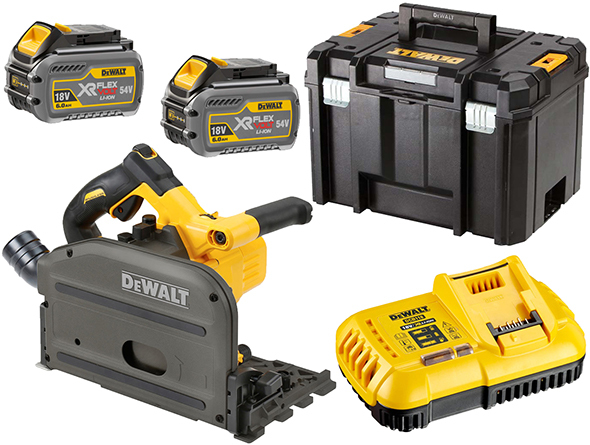 Enjoying my Dewalt Flexvolt special I got for $787 (2ah and 3ah, short and long tracks, track clamps and saw). Seems just as good as any other and super nice to whip it out and cut. For those wondering about a cordless saw for the bosch tracks. I purchased a cordless 18v bosch saw from the UK that uses the bosch track. Bosch also makes other corded saws that will run on its track. Did I mention the router base that works on the track and if you order track sections with the indexing holes, you can plunge cut holes on 5mm increments. I wish bosch would bring their full compliment of tools to the US but you can order from vendors in other countries to get access to them. I’ve seen some of those Bosch accessories and wondered why there aren’t those for U.S. market. If they have good accessories like that, it makes all the difference in choosing to purchase a tracksaw for some people like me. One of the reasons for the Festool fanbase, I think, is the whole system along with high quality aftermarket accessories. I think Bosch also has a jigsaw guide in Europe. Since I tend to buy Bosch corded tools like sanders and jigsaws I’d definitely be interested if I didn’t have two tracksaws already. Makita has a router guide that I’ve bought to use with my Festool track and it’s extremely reasonably priced, around $40 at the time, but not as high quality of those Bosch accessories from the looks of them. Wish Makita had more accessories, one of the weak points of their tracksaw, which I love by itself. Another point: The cuts from the Makita tracksaw using the Makita oem blade are so smooth I could cry with joy. Ready for finishing or glueups with no planer or sander involved. Their blades on my circular saw have been spectatular and long lasting as well. Another point for Makita. I wonder how the Bosch oem blades are? I can’t speak to Bosch circular saw blade quality, but I am always pleased with their accessories, such as their Swiss-made jig saw blades and their oscillating multi-tool blades. Also, if I might offer a reminder, Bosch is parent company to Freud and Diablo, who both make exemplary blades. I somehow got the impression that they only sell Diablo blades in the U.S., and Freud everywhere else. Freud pro blades in the U.S. are excellent and Diablo good quality for a low price. I replaced most oem blades with Diablo and now Freud in some cases, like their negative hook blade. Pete – thinking of purchasing the exact kit you got from Axminster tools…what is the frequency on the motor, 50 or 60 hz, and did you have to do anything other than change the plug end of the cord? Assume the only other difference is the units will be mm instead of inches correct? I asked a rep on the Bosch stand at a trade show about it several months ago and he said (without any equivocation) that it’s made for them by Mafell. It’s not quite up there with Mafell’s own tracksaw – arguably the best of all the corded tracksaws – but it’s not as expensive either. Also, any reason not to drop the extra $20ish and just get the tracks with pin-hole guides? Unfortunately, I haven’t seen something like that yet. Regarding track with pin holes, I don’t think there’s a downside, although there could be a catch I’m not aware of. I think it’s just about money saved for users that don’t need the feature.